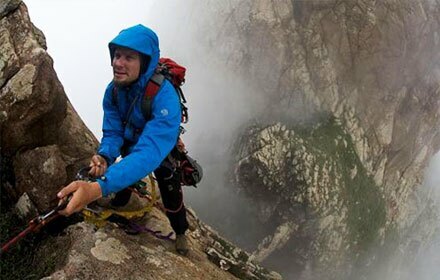 China has some excellent rock climbing sites to meet professional and amateurish rock climbers&apos; needs. If you plan to take part in some climbing activities in Beijing, Miyun Baihe Valley is the best choice in Beijing areas. Guilin&apos; Yangshuo in the Southern China is not only famous for its karst landscapes, but also is one of the best rock climbing destinations in China. 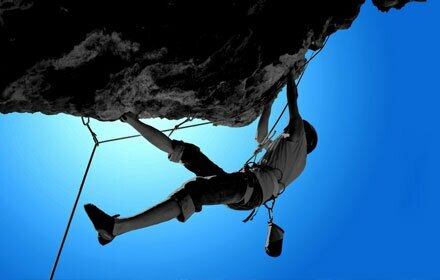 We list top rock climbing sites for your wonderful and excellent climbing journeys in China. Miyun White River Valley (Baihe Valley) is one of the top 2 nature rock climbing places in China, together with Yangshuo County in Guilin. It is a popular place to spend a weekend or a holiday loved by Beijing local people. Most excellent climbing spots are located around Jiangjiafen Village(蒋家坟村). There are more than hundred routes（YDS 5.7-5.13） with some interesting names such as "Good Morning","Cool Day","Perfect Mood" to meet your special needs. The Old Rock Spot(老岩场) is the most famous site near the village. Travelers can join a rock climbing or go fishing and hold a barbecue in the beautiful natural area. The climbing sites in the White River Valley are around 110 km from Beijing. This area has been developed for 8 years to offer some great climbing journeys loved by rock climbers. How to get there: Travelers can take a Bus 980 (about 10 CNY) at the Dongzhimen Long Distance Bus Station to Miyun Gulou (密云鼓楼) and transfer a car to Jiangjiafen Village. Situated in the Sidu Scenic Area, Beijing Sidu Crag has various routes. The spot is a popular climbing site suitable for climbing beginners. With grand and great rocks, it only comes to visitors&apos; sights in recent years. 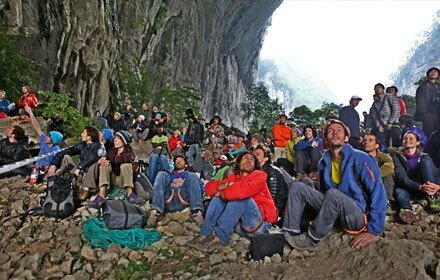 A large number of amateur climbers head to Sidu Crag to enjoy a great rock climbing journey. Sidu Crag has around 30 climbing routes with different styles and levels. Plenty of 5.10 lines are available for new rock climbers. At the same time, an 18-meter 5.12c climbing line can be a challenge for experienced climbers. Together with White River Valley, Sidu Crag is one of the most famous and popular rock climbing sites in Beijing. It is a great place to spend weekends. How to get there: Take bus 917 and get off at Sidu. Yangshuo County in Guilin is a rock climbing paradise for both professional and amateurish climbers. 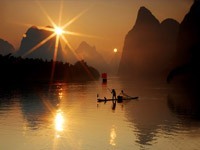 Due to its natural karst landscape advantage, Yangshuo offers some excellent climbing sites. The White Mountain(白山)，Moon Hill (月亮山) and Wine Bottle(酒瓶山)are the most famous and popular climbing sites in Yangshuo areas. There are plenty of professional climbing lines and easy routes to meet climbing beginners&apos; needs. 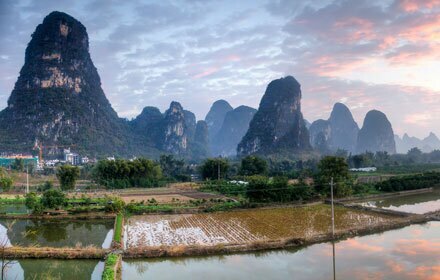 As the most popular climbing destination in Yangshuo, Moon Hill is not only an excellent place to take part in rock climbing, but also a wonderful chance to have a bird view of beautiful landscapes in Yangshuo. Besides, Yangshuo holds annually Yangshuo Climbing Festival which attracts numerous professional rock climbers and climbing beginners from the whole country. 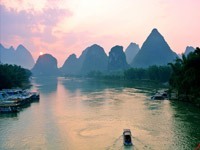 How to get there: Direct coaches to Yangshuo are available at Guilin Coach Station with a ticket of 18 CNY. Or travelers can take a bus in Guilin Railway Station cost around 20 CNY. The journey to Yangshuo is about one hour and a half. Located inside of 5A national scenic spot- Baiyun (White Cloud) Mountain Scenic Area, the climbing site offers a total of 18 climbing routes. The routes are more suitable for skilled climbers rather than climbing beginners. There are 3 different granite rock faces in the area. As the only climbing site in Guangzhou City, the Baiyun Mountain Climbing area-also known as Rubbish Granite Grag(垃圾花岗岩壁) by local people, has held abundant climbing activities. 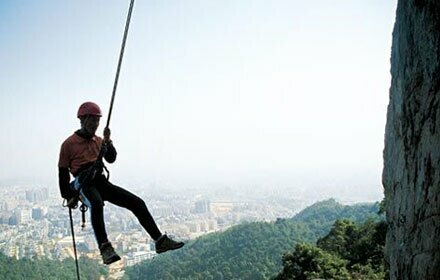 The climbing site is popular a weekend destination, so it&apos;s wiser to visit Baiyun Mountain on weekdays. In the north of scenic area, it is widely loved by experienced rock climbers in Guangdong Province. How to get there: Take metro line 3 and get off at Baiyun Mountain stop. Or take Bus 24, 65, 175, 223, 240 and 540 to Yuntai Garden stop (Baiyun Cable stop). We can Tailor-make a Rock Climbing trip for you. Free inquiry. Occupying an area of more than 40 square kilometers, Laoshan Mountain climbing site has been popular among rock climbers in recent years. There are around 150 climbing routes to meet your climbing needs. The official (also the best) climbing time is from March to November every year. 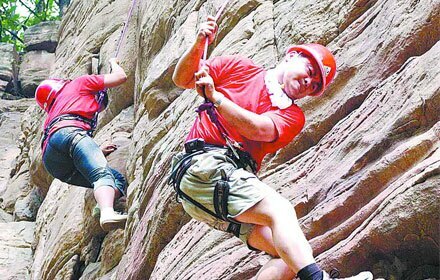 Travelers can experience the rock climbing and also enjoy natural beautiful scenery on the Laoshan Mountain. If you visit Laoshan Mountain in winter, you can try an ice climbing instead of a rock climbing. 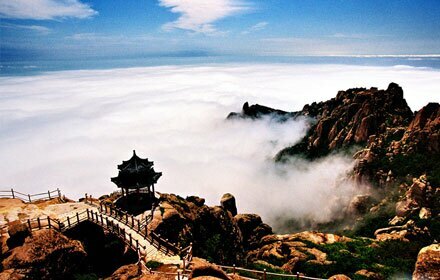 It is really an interesting and unforgettable journey in the Laoshan Mountain Scenic Area in winter. And Monkey Crag is another popular rock climbing site in Laoshan area. How to get there: Take bus 104,113,304 and 802 to reach Liuqinghe(流清河) or Bus 110,112,311 and 365 from Beijiushui（北九水）to Wolong Village（卧龙村）-outside of Laoshan Mountain Scenic Spot. We can Tailor-make a trip to Qingdao for you. Free inquiry. Fumin County in Kunming is one of large scale natural rock climbing sites. There are about 100 climbing routes from 5.8 to 5.13. It is a great place to take rock climbing for climbing beginners in Yunnan Province. And professional climbers can also enjoy a great fun at Fumin climbing site. 5 km away from Fumin County center, Tanglangchuan(螳螂川) Climbing Site has been developed for 7 years with great facilities. There are no bars and no crowds in the area but rock climbing. It is one of the best rock climbing places in the south of China. Great rock and beautiful scenery are highlights of Fumin County. How to get there: Buses to Fumin are available from 7:10 to 20:30 in every 10 minutes in Northwest Station with a ticket fee of 9 CNY. 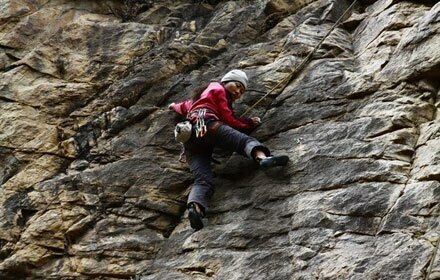 Duodi County, Lhasa&apos;s natural rock climbing site，is about 5 kilometers away from Lhasa City. It has been developed by Federation Francaise de la Montagne et L&apos; Escalade (FFME) and Tibet Mountaineering School since 2000. Nowadays, there are over 30 routes at different levels. And some great climbing clubs are open in Lhasa (must-visit capital of Tibet). You may have trouble to find a suitable winter rock climbing in China, but winter is the best time to climb in Duodi County. With comfortable climate and temperature in winter, Duodi County offers a great winter climbing journey. Winter is a tourism low season, so to take a climbing journey there is much cheaper than summer. Guizhou in the southwest of China has some great karst landscapes as Yangshuo in Guilin, so it offers some wonderful climbing sites for rock climbing lovers. Less travelled by visitors, Guizhou Province provides travelers with cheaper but excellent rock climbing sites. Rear Mountain cave (省政府后山四围洞岩壁), Four-sided River (四方河), and Guiding Cliff (贵定岩壁)are famous climbing sites in Guiyang with a total of 12 routes. Getuhe(格凸河) Valley, 3 hours away from Anshun City which is famous for Huangguoshu Waterfall (黄果树瀑布)is the best place to take some climbing journeys in Guizhou Province. There are routes from 5.7 to 5.14 for climbing lovers and professional climbers. 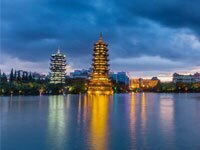 How to get there: Trains and buses are available to Guiyang and Anshun. Wanna take a trip to China and these rock climbing sites? China Travel can tailor-make a China Rock Climbing tour for you based on your needs and requirements which can save your time, money, and trouble. Please feel free to tell us your tour ideas! >> Tailor-make Now!